Known for its outstanding moisture retaining ability and viscoelastic properties, HA has established itself as a leading ingredient in the cosmetic industry. The most effective, top selling creams, lotions, serums, shampoos, conditioners, bath oils, foundations, lipsticks and lip balms usually contain this amazing ingredient. Most HA Serums, however, are at least 99% water! Making your own own fresh serums weekly will not only save you money, but also help you control what you put on your skin, and ultimately into your body. 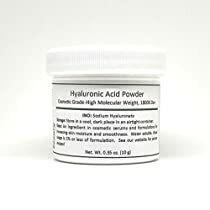 This product makes a luxurious serum when combined with RESURRECTIONbeauty’s L-Ascorbic Acid Powder (Vitamin C) and RESURRECTIONbeauty’s Glycerin with Botanical Extracts. Put it all in our 1oz. Treatment Pump for easy mixing and dispensing! (Please follow directions!) For an even better serum experience, add a few drops of our Frankincense and Myrrh essential oils! Contact us for other additive and recipe ideas. So why do we offer High Molecular Weight HA instead of Low Molecular Weight HA? High Molecular Weight HA has been shown less likely to cause skin reactions. Bulgarian RoseHand picked beneath the quiet of early morning sky, approximately 1,000 distilled roses yield the luxurious and pampering essential oil in each bottle of Beauty Elixir I. Studied for its ability to uplift spirits and combat acne, this gorgeous essence is best known for its softening effect on even the most environmentally challenged complexions. Kaneka CoQ10Known for its purity and integrity and as the only CoQ10 made in the USA, Kaneka’s yeast-derived CoQ10 has shown to diminish the appearance of discoloration caused by sun damage. Vitamin CHas robust antioxidant effects, UV protection properties, cell DNA protection, collagen protection and stimulation. Also, reduces hyperpigmentation, increases collagen levels, and repairs the effects of sun damage. Vitamin EVital in protecting skin cells from ultraviolet light, pollution, drugs and other elements that produce cell damaging free radicals. It increases the efficacy of sunscreens and assists in preventing and treating sunburn. BaobabHigh in omegas 3, 6, and 9, this oil is extremely nourishing and soothing, making it excellent for treating psoriasis and eczema. Lipid rich, it contains Vitamins A, D and F, critical for the rejuvenation and renewal of cell membranes. PomegranateDeeply nourishing to the outer epidermal layer, and a powerful antioxidant. Fades wrinkles and fine lines, revitalizes mature skin, improves skin elasticity, improves skin tone and gives your skin a healthy glow. Kaneka CoQ10Known for its purity and integrity and as the only CoQ10 made in the USA, Kaneka’s yeast-derived CoQ10 has shown to diminish the appearance of discoloration caused by sun damage. Vitamin CHas robust antioxidant effects, UV protection properties, cell DNA protection, collagen protection and stimulation. Also, reduces hyperpigmentation, increases collagen levels, and repairs the effects of sun damage. Vitamin EVital in protecting skin cells from ultraviolet light, pollution, drugs and other elements that produce cell damaging free radicals. It increases the efficacy of sunscreens and assists in preventing and treating sunburn. BaobabHigh in omegas 3, 6, and 9, this oil is extremely nourishing and soothing, making it excellent for treating psoriasis and eczema. Lipid rich, it contains Vitamins A, D and F, critical for the rejuvenation and renewal of cell membranes. Omega 3 + 6 +9Helps regulate the skin’s oil production while also keeping skin hydrated. Omegas act as an antioxidant to scavenge free radicals and prevent premature aging through inhibiting the release of enzymes that destroy the skin’s collagen, ultimately keeping collagen levels stable and your skin free of sagging and wrinkles. Cranberry Seed OilContains one of the highest antioxidant and phytosterol contents of any of the vegetable / fruit oils, making it an excellent addition to your natural sun protection products where it will help to prevent photodamage. Visibly reduce pore size and signs of aging by restoring collagen levels! 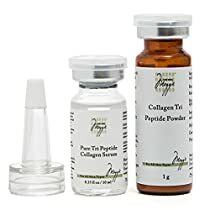 The power of active collagen tri peptides, three ceramides and hyaluronic acid restore elasticity and hydration while niacinamide (Vtiamin B3) soothes and heals even the most sensitive skin. This unique serum preserves the active power of the ingredients until time of use by packaging the active ingredient separately. Simply mix the serum with the collagen to give skin a treat! Suitable for all skin types. DIRECTIONS: Open both the liquid serum and the Collagen Tri Peptide powder, pour the serum into the powder bottle and shake well before use. Apply on clean skin under moisturizer morning and evening for best results. Refrigerate after mixing and use within 10 days for best results. Keep away from heat. WARNING: Not for those with seafood allergies. The Collagen Tri Peptide in this product are from fish.